Ocean acidification is occurring as a result of carbon dioxide emissions from industrial activity dissolving into the oceans, and involves a fundamental change in the chemistry of the global oceans. Perhaps the greatest challenge it presents to marine life that make their shells of calcium carbonate (chalk) is that it can make seawater so corrosive that their shells/skeletons begin to dissolve. Bednarsek (2012) examined the shells of pteropods (sea butterflies) captured live from waters around Antarctica and found that, in low pH seawater, the shells of the creatures exhibited marked corrosion. The presence of such highly corrosive water near the surface around Antarctica is a window into the future. Ocean acidification there will grow worse in time given current CO2 emission trends, and will pose a significant threat to the Antarctic marine ecosystem because the pteropod is a keystone species of the local food web. Fig 1 - animation of microscope images (with outermost organic layer removed) taken of juvenile pteropod shells retrieved from waters around Antarctica in 2008. In line with theoretical expectations, pteropods taken from areas of low carbonate ion abundance (aragonite undersaturation) exhibit obvious signs of corrosion. 100 micrometres (µm) = 0.1 millimetres). Images taken from Bednarsek (2012). Mention ocean acidification and the discussion inevitably settles around the pH of the oceans - a measure of the concentration of hydronium ions dissolved in seawater. Although pH is indisputably crucial to many biological processes which are affected by the degree of ocean acidity (see Baumann , Frommel ), it is actually the concentration (activity) of carbonate ions that appears to the the critical factor for many marine life. This is because carbonate ions are key building blocks of the calcium carbonate shell/skeleton, and part of the process of ocean acidification is a chemical reaction that reduces the carbonate ion concentration, thereby making shell-building (calcification) increasingly more difficult (See the Royal Society , Feeley ). In extreme cases, where the concentration of carbonate ions falls low enough, seawater can become physically corrosive to the shells and skeletons of marine critters, as can be seen in Figure 1. A better indicator of the corrosive potential of seawater than pH is the saturation state of calcium carbonate. The three calcium carbonate forms built by marine life are calcite (the most stable/least soluble), aragonite and high-magnesian calcite (the least stable/most soluble). Almost all calcium carbonate production in the ocean is carried out by biological activity because, despite being theoretically supersaturated with calcium and carbonate ions, there are energetic barriers which prevent the two ions spontaneously combining (precipitating) to form calcium carbonate. The formation of calcium carbonate, therefore, generally involves the aid of living things to make it happen. The formation and stability of calcium carbonate, however, ultimately depends on the background state of the seawater in which it is made. A higher concentration of calcium and carbonate ions in seawater raises the potential for calcium carbonate to form, and conversely, falling concentrations lower this potential. Once the saturation state falls to around 1, or to negative values, it is likely to cause the dissolution of calcium carbonate forms. Passing below this threshold is known as undersaturation and, because the current chemical make-up of the oceans favours the formation of aragonite, much of the discussion in the scientific literature centres around aragonite undersaturation. 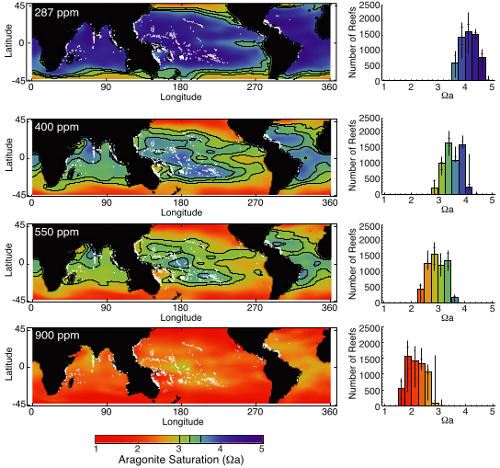 Figure 2 - Although excluding the Polar regions and focused on coral reefs, this image displays the surface ocean aragonite saturation state estimated (modelled) for the pre-industrial (287ppm CO2), present (400 ppm), and two future scenarios based upon continued fossil fuel use. It gives some idea of the wholescale changes in ocean chemistry. From Ricke (2013). You will note that there has been no mention of calcium ion concentrations, the other 'building block' of calcium carbonate, until now. That's because the concentration of calcium ions in seawater is essentially unchanging on the time scales under consideration here. Significant global-scale alterations depend on the rate at which calcium is expelled by volcanic activity and, therefore, vary substantially only at million-year time scales (Montañez , Stanley ). The essential point to note here is that the corrosive potential of seawater is only indirectly connected to ocean pH. Calcium carbonate forms don't dissolve because of acidification itself (an increase in hydroniums ions), and therefore has nothing to do with whether seawater is acidic, below 7 on the pH scale (it isn't), or above (alkaline). Calcium carbonate structures dissolve due to the lack of carbonate ions. In simple terms, this means seawater can be well into alkaline territory on the pH scale and yet still be highly corrosive to the various forms of calcium carbonate. What's Eating Southern Ocean Pteropods? The polar and near-polar oceans are areas where the consequences of ocean acidification are expected to first become apparent (Steinacher , McNeil & Matear , Fabry , Yamamoto-Kawai ). Not only are the waters very cold, which allows greater absorption of carbon dioxide into surface ocean (lowering both ocean pH and the aragonite saturation state with it), but they are home to huge volumes of low pH freshwater (in the form of ice), and are also prone to upwelling of low pH (corrosive) water from the deep. In 2008, as part of the British Antarctic Survey, the authors of Bednarsek (2012) collected live pteropods and water samples from the upper layers of the Scotia Sea - the region between the Antarctic Peninsula and the bottom of the South American continent. This area is where the powerful Antarctic Circumpolar Current, which circles Antarctica, is restricted by the narrowing between the continents (the Drake Passage). Cold (low pH) deep water is drawn up to the surface due to bumps on the sea floor and the action of surface winds (Ekman suction). Being rich in nutrients, this deep water fuels large phytoplankton blooms when it reaches the surface layers, and these phytoplankton blooms initiate an explosion in marine life populations that feed upon the phytoplankton - pteropods being among the opportunists taking advantage of the increased food availability. Aragonite undersaturated seawater near the surface in the Scotia Sea is only partially due to fossil fuel emissions. The water drawn up from the deep has not been in contact with the atmosphere for around a thousand years due to the slow oceanic circulation to and from the abyss, and therefore is not directly attributable to human-caused ocean acidification. But the mixing of industrially-derived CO2 into surface waters reduces the diluting effect when corrosive deep water and surface waters mix, and this aids in lowering the aragonite saturation state near the surface. Undersaturated seawater is expected to have repercussions on marine calcifiers, and this is indeed what the authors observed. Juvenile pteropods taken from aragonite supersatured (non-corrosive) Antarctic waters were largely free of signs of shell damage or corrosion. By comparison, those pteropods taken from areas of strong upwelling, and therefore wavering on the aragonite undersaturation threshold, exhibited obvious signs of shell corrosion to such an extent that it would probably have seriously diminished their chances of survival and the ability to reproduce. Lab experiments were also carried out on pteropods incubations so that a response index of the degree of corrosion could be established. In these incubations, CO2 levels were manipulated to mimic equivalent atmospheric carbon dioxide concentrations of between 375-750 parts per million (ppm). Figure 3 shows the relationship between shell dissolution and aragonite saturation state deduced from both the freshly collected pteropod specimens, and the separate pteropod lab experiments. Figure 3 - Upper row are the sampling stations from the Scotia Sea. Vertical axis denotes the depth, and the horizontal axis the aragonite saturation state. 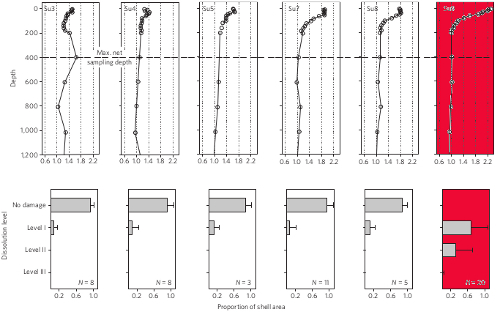 Lower row is the degree of pteropod shell dissolution observed for each station (above each box). The range is from no damage to level 3 (highest degree of corrosion). Slight dissolution evident at all stations is likely from the remineralization of upwelled nutrients, i.e. microbes converting organic upwelled material back into CO2. The aragonite undersaturated station is coloured red. From Bednarsek (2012). Even though the badly corroded juvenile pteropods were alive at the time of capture, they had likely only been exposed to this highly corrosive water for between 4 and 14 days (based on the authors analysis). Their chances of reaching a typical lifespan of two years would have been greatly diminished even if they had managed to avoid capture. This highlights a potential crisis developing in the Antarctic. The Antarctic pteropod is a cornerstone of the foodweb there. Large populations of this species are necessary (along with krill - see Kawaguchi ) in order to sustain the large number of fish and mammals that prey upon them. Should the Antarctic pteropod popoulation undergo collapse as a result of ongoing ocean acidification, and this is indeed possible, it's going to take down a large number of other species along with it. Globally, humans derive a significant amount of protein from the Southern Ocean, so it will affect us too (Cooley & Doney ). An additional aggravating feature of a possible collapse is that the pteropod is the main calcifier in the Antarctic. As such, it removes a large amount of carbon from the surface ocean - through the carbon stored in their shells and deposited in the deep ocean after death (Betzer ). Somewhat ironically, this removal of carbon from the fast carbon cycle (the surface oceans, atmosphere and land) by the pteropod acts to minimise ocean acidification in the Southern Ocean. A collapse of the pteropod population would therefore see ocean acidification proceed faster in the surface of the Southern Ocean. Not only do the results of Bednarsek (2012) validate the harmful consequences of aragonite undersaturation on pteropods observed in CO2-manipulated lab experiments, but they also underscore the fact that ocean acidification is happening today right under our noses. This is not some distant, abstract, threat to be palmed off onto future generations to deal with, this is something that can only (realistically) be minimised by reducing fossil fuel use now, or soon. Indeed, despite the fact that not all marine calcifiers are directly harmed by acidification and we don't know exactly how bad this might turn out, enough key species are threatened (coral reefs for example) that business-as-usual fossil fuel use poses a significant threat to our way of life. The oceans have seen an increase in acidification of close to 30% since pre-industral times, and are probably now on course to acidify faster than they have in the last 300 million years (Caldeira & Wickett , Honisch , Zeebe ). Given that emerging research is linking previous slower rates of ocean acidification with some of the major extinction events in Earth's history (Kump , Payne & Clapham , Hinjosa ), now might be a good time to get serious about ocean acidification. Better late than never. Coming soon: How Did Ancient Coral Survive in a High CO2 World?